Coming off their first win in a week, the Yankees looked to continue their success from Wednesday, where they beat the Angels 8-4. With their ace, Luis Severino, on the mound opposing Jesse Chavez, the Yankees looked like they were in a good position to possibly win the series. 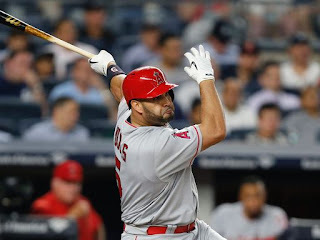 However, due to sloppy defense, plus no offense after the third inning, they were unable to pull away with a win against the Mike Trout-less Angels. The game could’ve started better. Cameron Maybin launched Severino’s second pitch of the game into the left field bleachers to give the Angels a 1-0 lead. Sevy bounced back though, and was able to get the next three batters to ground out on a total of ten pitches. The Yankees quickly answered in the bottom half of the inning. With two outs, Judge and Holliday walked, and Castro blooped a single into right field to score Judge and tie the game at one. After Severino set the Angels down in order in the top of the second inning, the Yanks managed to take the lead. After a double by Chris Carter (!!) and an infield single by Ronald Torreyes, Brett Gardner chopped a grounder to second. The Angels were able to get a force out at second, but Carter scored to give the Bombers a 2-1 lead. After Aaron Hicks singled to put runners on the corners, Aaron Judge worked a full count, and then blasted his 25th homer of the year to dead center to give the Yanks a 5-1 lead. He also has 57 RBIs now. The guy is a monster. Severino wasn’t as sharp in the third. He allowed a one out single to Cliff Pennington, and then walked Maybin. After Kole Calhoun grounded into a fielder’s choice, Albert Pujols punched an RBI single into right center field. 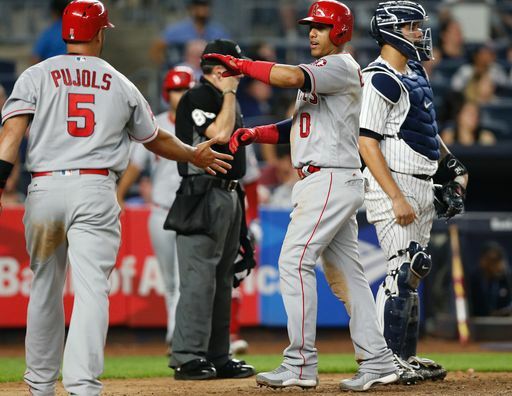 Yunel Escobar then slapped another RBI single in almost the same exact spot, and the Yankees’ lead was down to 5-3. Severino induced a groundout to escape any further damage, however. During that inning, he seemed to not have good control of his slider, which led to most of the hits. He bounced back nicely in the fourth though, striking out two and retiring all three Angels he faced. The fifth inning went pretty much the same way for Severino. Even though he walked Pennington to lead off the inning, he ended up striking out Maybin and Pujols to escape unscathed. The Angels continued to chip away in the sixth, however. After a leadoff double by Escobar, Luis Valbuena lined a single up the middle to score Escobar, and make this a one run game. A double play and another groundout, sandwiched around a single by Eric Young Jr., ended the inning, but the score was now 5-4. At the beginning of the seventh inning, the Yankee defense cost them. After Pennington led off with a single, Maybin hit a grounder to second that should’ve been a double play. Castro missed it, however, and the ball went into the outfield, giving the Angels first and third with nobody out. Girardi then took Severino out, and replaced him with Chasen Shreve to face Kole Calhoun. The Halos' right fielder flew out to fairly deep center, and Pennington scored, tying the game at five. Girardi then replaced Shreve with Dellin Betances, who inherited a runner on first with one out, while facing Albert Pujols. Maybin then stole second on the first pitch Betances threw, and moved to third when Sanchez’s throw sailed into center field. Pujols then lined a single to right field, and Maybin scored to give the Angels a 6-5 lead. Betances continued to struggle after that, walking Escobar, and throwing a pitch to the backstop that allowed the runners to move up to second and third. Valbuena struck out on an inside breaking ball for the second out, but Andrelton Simmons then drilled a two-run double to left, making it 8-5, Angels. Eric Young struck out to end the inning, but the damage was done. The Angels brought in Cam Bedrosian to pitch the bottom of the seventh, and he worked a 1-2-3 inning. Domingo German came in to pitch the bottom of the 8th, and served up a double to Pennington after striking out Maldonado. A wild pitch moved Pennington to third, and then Maybin walked. A wild pickoff throw from German allowed Pennington to score, and for Maybin to reach third, who later scored on a sac fly from Calhoun. 10-5, Angels. This was a sloppy defensive game for the Yankees, to say the least. Keynan Middleton came in to pitch the eighth, and he struck out Judge to start it off. Holliday and Castro grounded out to end it. It seems like Middleton has pitched in every single Angels-Yanks game this season, and each time the Yanks couldn’t figure him out. Oh well. German pitched a 1-2-3 ninth inning, and the Yankees came up to bat in the bottom of the inning. David Hernandez was the pitcher, and he struck out Gary Sanchez to begin the inning. Chris Carter then singled to left, and that broke a streak of 15 consecutive batters retired by the Angels’ pitching. Torreyes grounded out to second, however, and the Yankees lost 10-5. They will look to once again get back on track tomorrow against the Rangers and Yu Darvish.